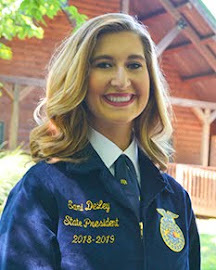 My year serving as a state officer has been full of surprises, amazing people, new experiences, and above anything else it has been full of blessings. One of those many blessings took place on Tuesday, November 18 at Lucas Oil Stadium. 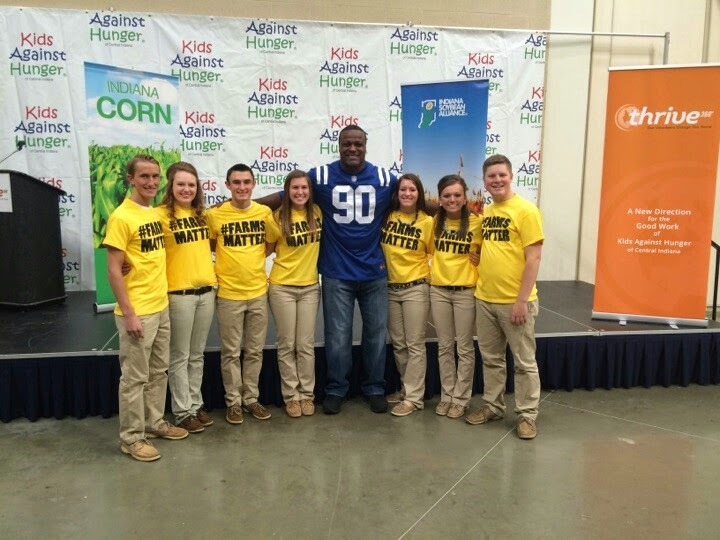 For the past 4 years the Colts have partnered with Kids Against Hunger (now known as Thrive 360) for what they call “The Million Meals Marathon”. The name says it all, but starting at about 8 am 4,000 volunteers fill Lucas Oil Stadium over the course of the day to fill over 1 million bags of food to help feed children who are food insecure. 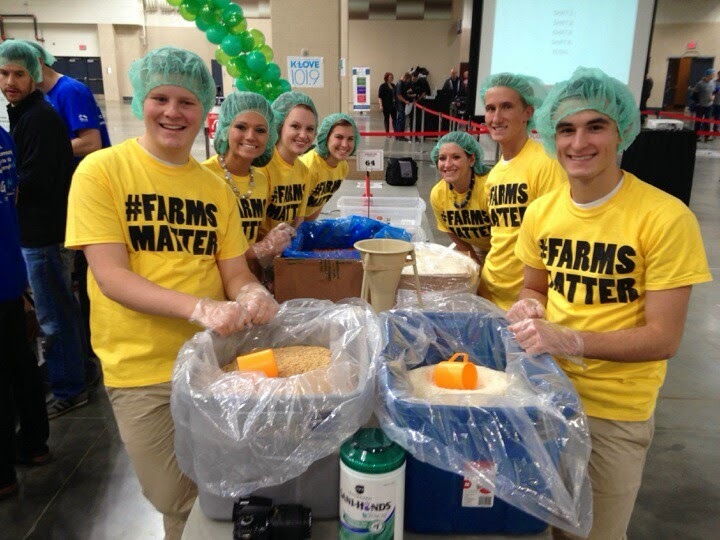 The state officer team, as well as the volunteering Indiana FFA chapters, worked the first 3 hour shift of the day and achieved the feat of filling 252,000 bags of food. Pretty amazing, right?! As amazing as those numbers are, they aren't what impacted me most throughout my day there. When we first arrived a couple of key sponsors of the event gave opening remarks that really stuck with me. The first one was from Founder and Board Chairman of Thrive 360, Dan Hintz, “Within three or five miles of anyone, there’s somebody in need who doesn't know sometimes where their next meal is coming from.” What Mr. Hintz said really hit me because it’s easy to forget that hunger doesn't just happen in 3rd world areas. It happens even in Indiana. It happens right down the road. Not only did it put hunger into a different perspective for me, but it also set the tone of our work day. Another thought provoking quote I gathered from the day came from the Indianapolis Colts Defensive Tackle #90 himself, Cory Redding. “You have to have a tremendous amount of energy, passion to do this. This is not centered around you this is centered around starving children around the state of Indiana.” I truly appreciated what he said for a couple different reasons. First of all, it was a great reminder as to why we were there for the day. Second of all, it was a great reminder as to what this year is all about for me. Taking what he said out of the context of hunger, this year is all about the members. 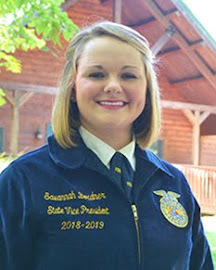 One of the biggest reasons I wanted to serve as a state officer was so I could meet more members and learn their stories. 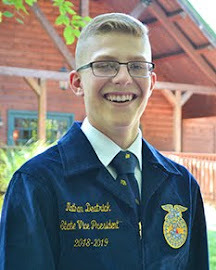 I’ve learned that FFA members have some really amazing goals and aspirations for their lives! Having said that, I worked with a couple different table groups throughout my 3 hours so I could talk to as many members as possible. Let me tell you what, I met some incredible people! One of the first questions I asked when I joined a table was if the members had any ideas about what they wanted to do when they got of high school. I heard some excellent answers such as how some wanted to be vets, or doctors, or ag teachers. I talked to a couple people who have a passion for traveling and they want to visit the world when they graduate. I talked to members with hearts the size of Texas who weren’t completely positive where they wanted to go, but they knew without a shadow of a doubt they wanted to be in career field where they could help others. 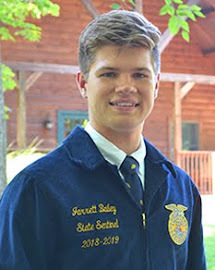 What encouraging answers to hear from the next generation of agriculturalists! However, in the many answers I heard throughout the day there was one answer that stopped me in my tracks. I was busy sealing bags (my designated role) when I asked the boy standing next to me this exact question. He paused for a minute, and then looked at me. Wow. All I could manage was a smile and a “That’s amazing to hear, I’m sure you’ll make that impact.”, but my mind was swirling. This was a sophomore whose main goal was to improve the world. Talk about inspiring. It was perfect to be able to help with the Million Meals Marathon right before Thanksgiving especially since giving feels so much better than receiving. It also helped remind me of all the blessings in my life. I’m beyond blessed to have a loving family and always having a meal on the table, but I have so much more to be thankful for outside of that. I’m thankful for the opportunity I have to travel this year. I'm thankful to have gained 3 brothers and 3 sisters. 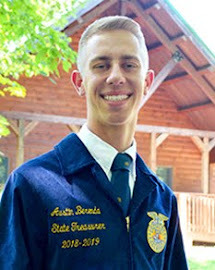 I’m thankful to be able to speak about my passion for agriculture nonstop. I’m grateful to be able to meet people who want to change the world around them. 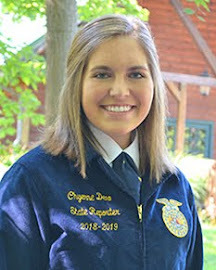 Most of all I’m so incredibly grateful that I made the decision to join FFA 4 years ago. What I’m trying to say is thank you. Thank you to my family who has supported me every step of the way. Thank you to the advisors who dedicate their time and passion to agriculture as well as their students. Thank you to the members who have welcomed me in like an old friend. 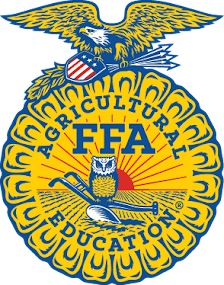 Thank you Indiana FFA for being the amazing organization that you are. 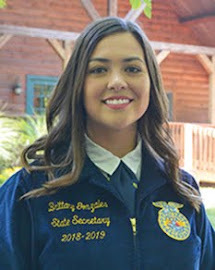 Last Saturday was a busy day for most of us here in the State Officer house. And, when I say most of us that includes everyone except me. I found myself home alone, and without much to do. I didn’t really want to sit alone and watch a movie. I wasn’t hungry. I had already been running earlier that day, and I was tired of working on scholarship applications. So I decided I would kill the rest of the afternoon by paying a visit to the Trafalgar Library. I walked in with my backpack containing all the devices I might need to get some work done should the notion come over me. However, as I found a quiet spot near a window, I didn’t feel like doing any work at all. I set my things down and started wandering aimlessly through the shelves of books. I made my way through the low canyons of books, carelessly skimming the titles as I strode past. I wasn’t looking for anything in particular, but eventually I found a book that grasped my interest. It was about life in medieval England. Standing there surrounded by countless books, this particular one stood out to me as I thought about the fact that I knew very little about life in medieval England. Satisfied, I grabbed the book, and returned to my seat. For the next hour or so, I skimmed through the book picking up random bits of information on everything from the diet to the social order to the role of the Christian Church in eleventh century England. Later that afternoon, after reading a fair amount of that random book, I left the library feeling satisfied that I knew more than I did when I entered. I don’t feel like I know everything about everything. Honestly, I don’t feel like I know everything about anything, but I love the feeling of knowing more than I did previously. I must admit, I have a habit of going to libraries and picking up random books. Sometimes it’s a book about tax law, or Greek architecture, or renaissance painters, or Islam, or forms of Government around the world. The subject of the book isn’t so important, as long as it provides the opportunity to learn something new. The reason I’m telling you all this isn’t to clue you in on one of my many odd quirks, but to express the idea of being a life-long learner. Being someone who has completed high school, I can state that high school will not teach you everything. There is still a lot out there to learn. That is why I have created a challenge for myself, and I am now extending it to anyone who reads this. Recently, I have challenged myself to find fifteen minutes every day to get on the internet or open a book, and learn something new. Some days I spend that fifteen minutes browsing the New York Times leaning about current events. Some days I come up with a random question like: what was Julius Caesar’s childhood like? Then I google it, and try to come up with an answer. Some days that fifteen minutes is much more than fifteen minutes, and it is spent in a library looking for books on topics that I don’t know much about. Regardless of how you spend those fifteen minutes, I simply challenge you to find them, utilize them, and learn. Try to learn something every day, and become a true life-long learner. If you would have asked me last week how I was doing, I would have answered with a statement along the lines of being busy and not having enough time to get things accomplished. Come to think of it, I find most of my friends and acquaintances living this very same busy lifestyle almost every day. Today however was different. No major obligations. No important tasks. No timeline or schedule to follow. In this society we all are a part of, it seems that days like today are becoming few and far between. A typical day in most of our lives looks something like this: wake up far earlier than we’d like, prepare for our day by eating breakfast with the seemingly endless noise of negativity coming from the morning news, drive to work or school later than we had planned, sit through our day for hours on end, drive home thinking of all we still have to do, complete some form of “homework” (supper, dishes, school work, etc), and try and catch some rest before this cycle begins all over again the very next day…and the day after that…and so on and so forth. Today, while being caught bored and making tasks to accomplish to occupy my time, a thought began to form in my head. How did we end up living like this? Why do we do this to ourselves? When did we forget that we are human beings, not human doings? Let’s look back at a typical day in the life of me, Derek Berkshire. Kicking around a soccer ball, making the world’s greatest mud pies (you all know you’re guilty of making a few in your day too), climbing trees, creating the next famous work of art using my unique art supplies…crayons, building forts throughout the house, and living in my self-created world. I had no agenda. No responsibilities. No schedule dictating my actions. Don’t get me wrong, I am well aware that this life I now live, a more adult life with actual responsibilities, is vastly different from that of my youth. However, what changed to make my life and perhaps yours too, one with a seemingly endless to-do list, so different from the life I once lived? When did a family supper, a meaningful conversation with a friend, random trips to the movies, spontaneous phone calls, game nights, and all of those other “past times” we used to partake in become inferior to the life we now live? The life full of obligations, bills, paperwork, house cleaning, schedules, meetings, jobs, and so much more. How did we create a world in which we have more and more and more to do with less time for leisure, less time for reflection, less time for community, less time to just…be? For me it’s a multitude of things. Technology, the natural pace of society, deadlines. It seems that we have created a world in which we must have no down time in order to feel satisfied; yet, at one point in our lives we felt content with the simplicities that now escape that very same person. It’s true; life has evolved. To a certain extent, we are forced to live a life full of actions in order to succeed or make ends meet. Our lives are full of schedules and lists and a plethora of other occurrences. Perhaps, we must live this newly evolved life void of mud pies and crayons. Perhaps, down time simply is ceasing to exist. Regardless, the question remains. How are you doing? With that question in mind, I would have answered this way: I am a busy human being. “Being” used with extraordinary care. No, I’m not a human doing despite my phone, laptop, to-do lists, and schedules being used each and every day. You see, it’s all about attitude really. Those healing conversations, that connection with my friends and family, the fact that I’m doing what I love…that is what makes today—along with every day—great. So go ahead, with that in mind, ask me. How am I doing? I know what I’ll say. I am too busy and feel there is not enough time to get things accomplished but that’s okay, I am doing great. How are you doing? When I woke up this morning I decided I would make today great! Not for a particular reason other than I just wanted to. It was not until I was in the drive thru at a fast food restaurant that I realized attitude is everything. This is something that most would think to be common sense. You’re probably thinking, “well yeah, duh, I already know this”. But no, seriously. I realize that attitude can determine a lot of things throughout our lives but attitude is something that I seem to overlook in most situations. When I was in the drive thru this morning, I was cheerfully greeted by the lady on the other side of the intercom. She welcomed me by saying, “Good morning, how may I help you?” This is the usual for most fast food restaurants but it was different this time. The words were the same but the tone of the lady's voice was genuine and real. She seemed thoroughly excited to be alive and awake this morning! Instantly I began to smile as soon as I heard her enthusiastic voice. Because of this lady's energetic and vivacious attitude, this helped me carry on my optimistic attitude for the day ahead. I truly believe that the woman at the restaurant loved her job and because of that she possibly has brightened the day of everyone who goes through the drive thru. As I proceeded to Starbucks to work on a few things, I had a seat in the corner. An older man named Steve came in the door and instantly was greeted by name by the people behind the counter. He came over and had a seat across from me. Instantly he began having a conversation with me about how often he has seen me at Starbucks (I’m guilty), and he joked with me and told me that as long as I don’t take his seat then we will both be okay. It was obvious he was a regular. As he continuously joked with the folks that were working, we talked about everything from politics to what I planned on majoring in in college. We talked about his years in the Army and at the downtown post office to his dreams of moving down south. We talked about his dogs to beautiful places to go to in Indiana. We talked about his planned vacation with his family and about his retirement. He talked about his grandson who he proudly boasted about and he talked about fishing while listening to all of his tunes on his iPad. Before Steve left he told me to have a great day and he asked me a few questions about FFA. After a few more minutes of talking with others at Starbucks he was on his way out the door to go hunt down a gas cap for his lawn mower. I’m pretty sure Steve doesn’t know a stranger! Steve loves life and he loves people. Whether he’s at Starbucks on his iPad or texting his friends when he’s supposed to be finding a gas cap for his lawn mower because his wife told him to or whether he is meeting new people and striking up conversation with strangers, Steve makes every day a great day with his wise, optimistic and amusing attitude! So what kind of attitude will you have today? Will you let one frustrating or upsetting situation determine the attitude of your entire day ahead? If you forgot your homework, struggled on a test, was told some bad news about an ill family member, had a flat tire, woke up with a cold, didn’t have your coffee this morning, only got a few hours of sleep, or maybe you had no reason but you just woke up in a bad mood out of habit, face the day with a smile on your face! Try to determine your attitude first thing in the morning as soon as you take that first step out of bed, just know that today will be great!